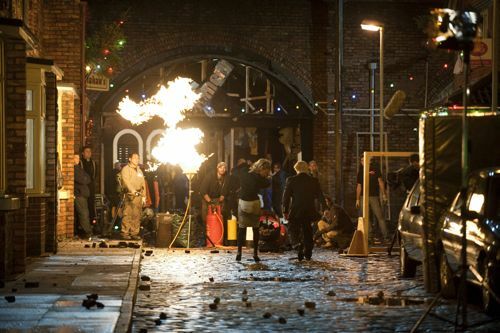 ITV has released behind the scenes photos of the tram crash set to devastate lives in Coronation Street. They include the first image of the “replica tram” after it was positioned on the cobbles, ahead of filming of the disaster aftermath this coming week. 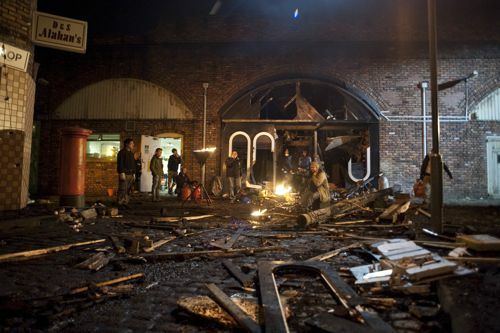 A massive explosion will rock The Joinery – Nick Tilsley’s new bar under the arches – causing the tram to career off the viaduct and on to the cobbles below. The front of the tram will crash into Dev Alahan’s corner shop with the second carriage swinging round and hitting The Kabin. The drama will be screened in the week of Corrie’s 50th birthday – Dec 9 – with lives changed forever. 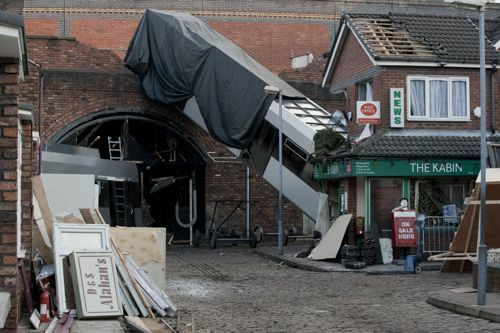 A Coronation Street spokeswoman said: “Crew, special effects experts and crane operators worked round the clock to get the tram into position before the filming of the devastating aftermath of the crash starts in earnest next week. “Months of work have gone into designing and building the replica tram with the help and co-operation of Manchester tram operators GMPTE. “Cast and crew have already shot the explosion scenes on numerous shoots working through the night, assisted by stunt doubles, pyrotechnics experts and a special effects team who worked on Dr Who and Hollywood blockbusters. 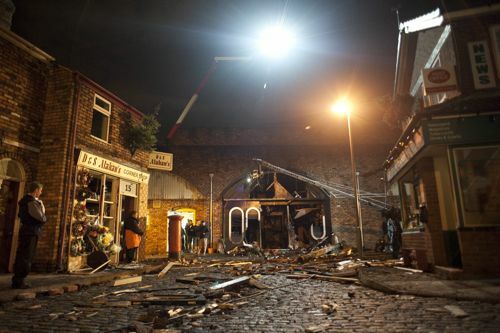 Coronation Street producer Phil Collinson said: “All last week we filmed the exciting and explosive moments that lead to the tram crashing from the viaduct. “The early scenes are wonderful and everyone is pulling together through the night to bring the brilliant scripts to life. You can hear more about the Street’s 50th anniversary in my podcast. Posted in Coronation Street and tagged Coronation Street, ITV, Phil Collinson, Tram. Bookmark the permalink.